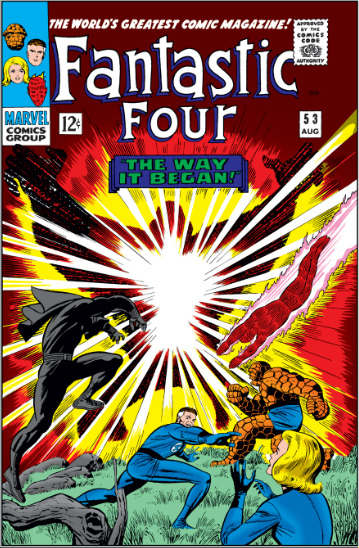 Re-reading the Fantastic Four comics from the start. Issue #53 begins with the Fantastic Four and their pal Wyatt Wingfoot as honored guests in Wakanda, where they are guests of the country’s leader, the Black Panther. Hidden away in the jungles of Africa, Wakanda is a nation of high-tech wonders. After a ceremonial dinner, the Panther takes the FF and Wyatt to his private residence, where he explains his origin story. He explains that he is the son of T’Chaka, a great hunter. T’Chaka discovered Wakanda’s famed vibranium mound. What’s vibrainium? The Panther, with help from Reed, explains that vibrainium absorbs vibrations around it, making it a useful and highly valuable metal. Wakanda is the only source of it in the world. T’Chaka’s reign came to end when the evil Klaw, master of sound, arrived in Wakanda to claim the vibranium for his own. Klaw killed T’Chaka, and T’Chaka’s young son vowed revenge. 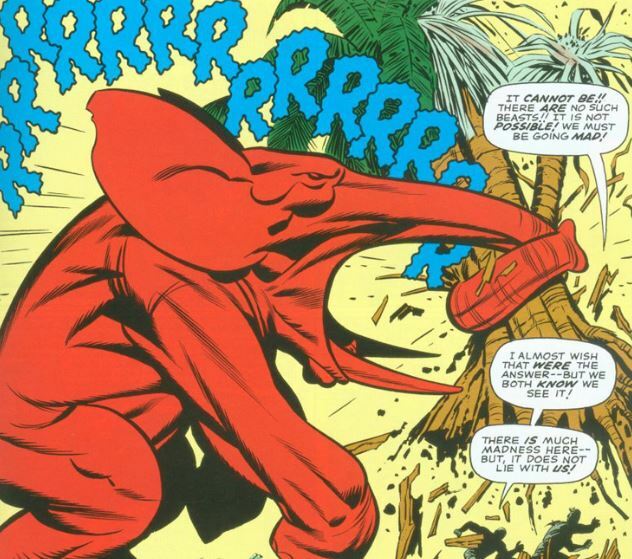 It’s then several pages of high drama as Klaw tries to burn the Wakandans out of their homes, and the little boy takes one of their sonic weapons and goes wild with it, injuring Klaw’s hand. Now, it’s years later, and the Panther fears Klaw will soon return. Then we get a rundown of the Panther’s skills and abilities. In addition to his vast wealth, Panther has been educated in the world’s finest universities. His fighting skills and speed, and his ability to see in the dark, come from herbs and rituals known only to him and a select few. The Panther says he attacked the FF last issue not to test them, but to test himself, so that he knows he’ll be ready for Klaw’s return. Meanwhile, two Wakandans out on patrol come across a torn-up patch of jungle, where they are attacked by two giant crimson-colored monsters. More monsters attack, and the Wakandans believe this means Klaw is back. The Black Panther and the FF head off to join the battle. Then, more fighting! At one point, the monster grabs Johnny, and Ben risks it all in the midst of the intense flames to save his teammate. The Black Panther flips a power switch on Klaw’s device, causing it to overload. “You did not realize I am a scientist, too!” he says. 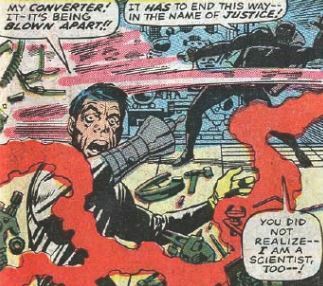 (Homer: “Batman’s a scientist.”) Klaw’s hideout is destroyed in a huge explosion, and the battle is over. The Black Panther wonders if he should retire now that the threat of Klaw is no more, but the FF cheer him up, saying Wakanda, if not the world, will always need the Black Panther. Good thing, too, because at the end, we see Klaw has survived. He steps into the remains of his sound machine and is transformed. But into… what? We’ll have to wait to see. Fade out: Sue is right there to catch her teammates in a force field after Klaw’s monsters throw them around. Flame on: To escape Klaw’s monsters, Johnny burns so hot he nearly burns the Thing. There’s also one obligatory reference to him still being miserable about being separated from Crystal. Trivia time: The story goes that around this time, Marvel was preparing a secondary line of all-new superhero comics. Supporting characters from this era were allegedly created to headline their own series, which never happened. These characters include the Inhumans, the Black Panther, and even Wyatt Wingfoot. While the Inhumans and Black Panther have had series of their own in the past, they’re usually supporting characters. The Black Panther’s real name, T’Challa, isn’t used in this issue. When not called “The Black Panther,” he’s instead referred to as merely, “the son of T’Chaka.” The character was allegedly going to be called “The Coal Tiger,” and would have worn a red cape with yellow striped gloves and boots. Call me crazy, but the all-black look is way better. Klaw in this issue is a human with a metal hand. The next time we’ll meet him, he’ll be a lot different. Fantastic or frightful? 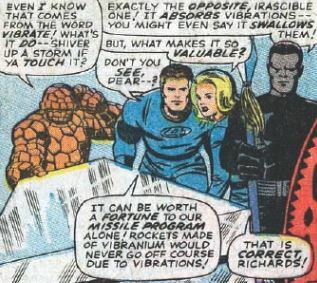 This is basically a Black Panther story guest-starring the Fantastic Four. But that’s all right, because Stan and Jack have done a great job making the Panther cool. He’s got a great look and all kinds of slick fighting skills. He’s pretty much a Kirby Batman, and that’s awesome. All in all, this is a fun read, making up for the previous all-they-do-is-fight issue. Next week: Don’t be givin’ me the stink-eye!